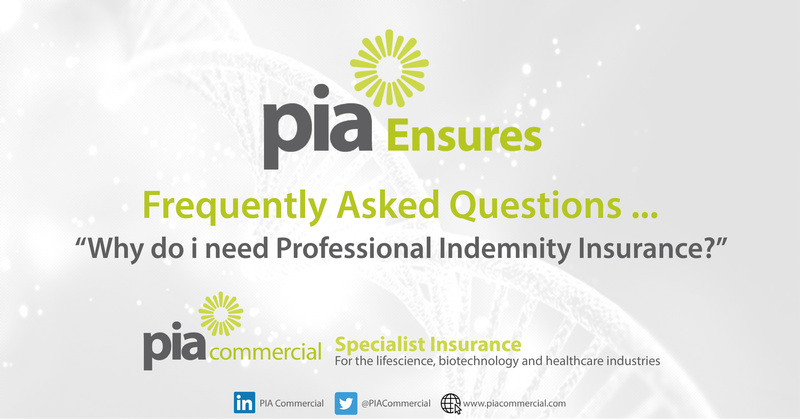 PIA Ensures: Why do i need Professional Indemnity Insurance? Professional Indemnity Insurance is highly recommended for Medical Writers due to the simple fact that they are primarily writing about serious conditions, drug development, diseases and various topical health issues which are available not only to other peers in the medical field, but the general public. As a result, this is why it is considered a fairly high risk profession … As anything other than top tier written content could be construed as misleading the audience. So let’s dive into what Professional Indemnity Insurance actually is and the rationale behind WHY it should be taken out. What actually is Professional Indemnity Insurance? Professional Indemnity Insurance will protect your financial interests, client relationships, and your reputation. It will assist in minimising the disruption to your business if you or a sub contractor make a mistake in the course of your work for a client. Even if you have done nothing wrong, but a client alleges negligence on your part, the policy will still protect you and pay the legal costs in defending you. Without professional indemnity cover in place, you’d have to defend any allegations of mistakes out of your own finances – which is why it’s typically regarded as essential business insurance. Who is legally liable for your written content? It’s vitally important to have crystal clear, clearly defined terminology in a contract involving written content, so that all the parties involved are completely aware of what’s been explicitly agreed with any work that is undertaken. If you sign a contract that a Medical Writer signs states explicitly that the liability sits with them (and NOT the company) then the Medical Writer could be responsible from a legal point of view. So it is EXTREMELY important to review contracts with a legal professional before anything is signed. Ideally who should be liable for the content written? At the end of the day someone has to take liability in the event that some takes issue with the content a Medical Writer has produced (or in certain cases something more serious has arisen as a result of the content). This alone makes it extremely important that the contract a Medical Writer receives states that the liability is assigned to either the business, client or publisher; in place of the Medical Writer themselves. So do Medical Writers actually need to have Professional Indemnity Insurance? The expectation is that if you have an ‘airtight’ contract that … as previously stated, places all the liability to the client or publisher of the content, then why would the Medical Writer need the insurance? Well, simply contracts by themselves don’t really stop people from placing blame or filing a grievance with YOU, that’s why at PIA Commercial we highly recommend that Medical Writers take out Professional Indemnity Insurance. Don’t engage or undertake work with ‘dodgy’ clients who are actively encouraging you to write dishonest content to fit their own personal or organisation agenda! Be fully aware of your countries regulations in regards to Medical Writing. Seek legal advice and ensure your legal representative reviews your contract! Yes, having legal representation can be expensive. However, having someone review and okay a contract for a piece of work you are about to undertake should give you 100% clarity and peace of mind. This is extremely more important for freelance medical writers, as being freelance comes with a higher level of risk vs an employed medical writer … That’s an unfortunate cost to being your own boss. There’s no guarantees that you can be 100% covered by simply being careful … Especially in the medical writing field. However, a specialist Professional Indemnity Insurance plan from us here at PIA Commercial can keep you protected if the worst were to happen. Even if you’ve done nothing wrong but an accusation is brought up, our policy will keep you fully protected and even absorb the legal fees. Insurance can be arranged for work undertaken in the UK, EU, and Worldwide including North America, including contracts with overseas jurisdiction.